Jealous partner jailed for 13 years for Christmas Day stabbing. A jealous partner who repeatedly stabbed his former lover's new man, after breaking into her home in the early hours of Christmas Day, has been jailed for 13 years. "Controlling and possessive" Devenn Sutherman, 26, shouted "die" at victim Scott Lathom as he knifed him twice to the chest and six times to the shoulder and arm during a frenzied attack, Bolton Crown Court was told. Seven months on from the confrontation, at his girlfriend Nicola Taylor's Hindley flat, Mr Lathom, who suffered a punctured lung, still has flashbacks, the court heard. 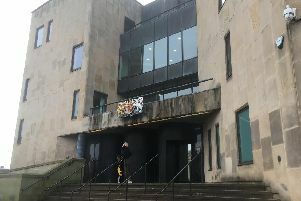 Sutherman, of Nelson Square, Bolton, pleaded guilty to wounding Mr Lathom, with intent to cause him grievous bodily harm, assaulting Miss Taylor as part of the same incident and aggravated burglary. Jailing him, Judge Timothy Clayson said it was fortunate that the "sustained attack" did not prove to be fatal. Sutherman, who had a child with Miss Taylor, was originally accused of attempted murder in relation to Mr Lathom but prosecutors accepted pleas to the alternative charge.